Bed, Bath & Beyond Inc. (BBBY - Get Report) - Beyond Week starts on Monday, July 16, with discounts on products online and in stores. Target Corp. (TGT - Get Report) - Online-only sale begins Tuesday, July 17, and offers discounts of up to 30% on its private label products. Customers who spend more than $100 will receive a free six months of Shipt, Target's same-day grocery-delivery service. Nordstrom Inc. (JWN - Get Report) - Offering early access to its anniversary sale until July 19; and its One-of-a-Kind Nordstrom Anniversary Sale goes from July 20 through August 5, both online and in-stores. Walmart Inc. (WMT - Get Report) - Walmart started its Ultimate Summer Savings sale began on Saturday, July 14, with online-exclusive deals. Best Buy Co. Inc. (BBY - Get Report) - Sale and price-matching Amazon Prime Day prices on the same product. Lowe's Companies Inc. (LOW - Get Report) - An extra 10% off on July 16 and 17. Prime Day is Amazon's 36-hour sale for Prime members that starts on Monday, at 3 p.m. ET, and lasts through Tuesday, July 17. Other retailers such as Macy's Inc. (M - Get Report) , Costco Co. (COST - Get Report) , Kohl's Corporation (KSS - Get Report) and GameStop Corp. (GME - Get Report) were preemptive with their sales by offering deals the week before the big Amazon sale began. As Prime Day has grown -- from $900 million in sales 2015, its first year, to $2.41 billion in 2017, according to retail research firm Digital Commerce 360 -- bricks-and-mortar businesses have increasingly been feeling the effects. PlaceIQ expects a similar drop on this year's Prime Day among bricks-and-mortar retailers. For the first time, it's also monitoring grocery stores, because of Amazon's promotions at Whole Foods. Prime members who shop at the upscale grocery chain between July 11 and 17 receive a free $10 when they spend more than $10. 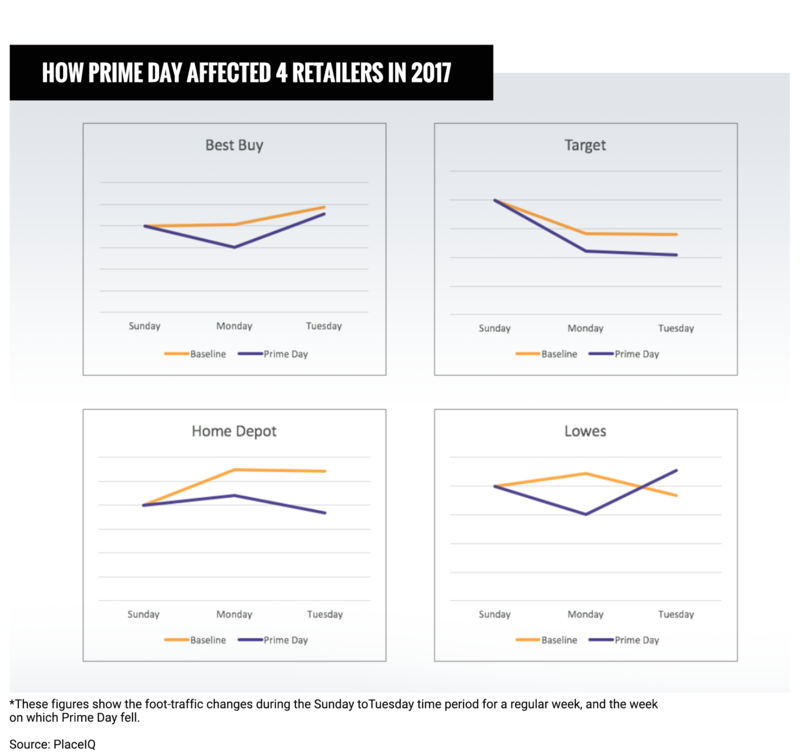 "Prime Day interrupts the weekly rhythm of traffic to hardware and big box stores, and we expect to see the same thing this year, and see if it grows," Drew Breunig, senior vice president of PlaceIQ, told TheStreet. Grocery store sales may also be impacted, he added. Location intelligence company Foursquare also saw a decline in foot traffic at brick-and-mortar stores during Prime Day 2017. "As compared to an average summer week (excluding July 4th week), we found that all major retail categories saw a dip in foot traffic around Prime Day, with some recovery seen the week following (July 17 to 23)," said Sarah Spagnolo, director of communications at Foursquare. Its research showed a drop of less than 1% at electronic stores to some 3% at department stores. E-commerce accounted for nearly 9% of total retail sales in 2017, according to the U.S. Census Bureau, a number that's projected to grow. Jim Cramer and the AAP team hold positions in Amazon.com Inc., GameStop, Kohl's and Nordstrom Inc. for their Action Alerts PLUS Charitable Trust Portfolio. Want to be alerted before Cramer buys or sells AMZN or JWN? Learn more now.